Benefits of Having a Pet #Infographic ~ Visualistan '+g+"
Everyone knows that pets are amazing. In fact, most people consider their pets to be family members. What many people probably don’t realize is that pets are good for our health and wellbeing, too! For example, research shows that people with pets have significantly lower heart rates and blood pressure compared to similar individuals without pets. This graphic from AAAStateofPlay.com serves as a reminder of why people feel a deep connection to their furry friends. 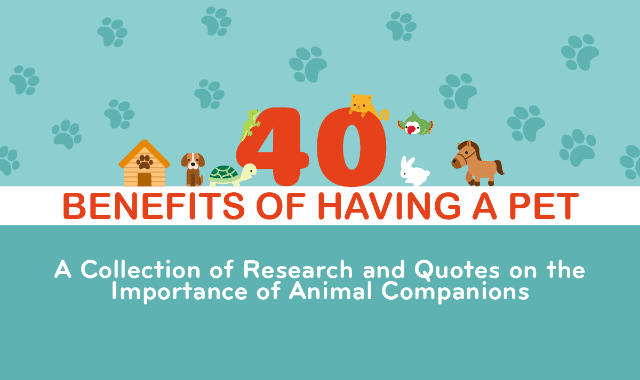 It includes a mix of scientific and medical facts about owning pets, research studies, and illustrations of some of our favorite animals. There are also a variety of quotes by well-known animal lovers sprinkled throughout. Lastly, the graphic explores the positive mental effects of pet ownership, including things like helping kids develop non-verbal communication, and even dealing with PTSD symptoms. Looking to keep your home safe while you’re away? This graphic explores the benefits of pets on home security, too! Enjoy!